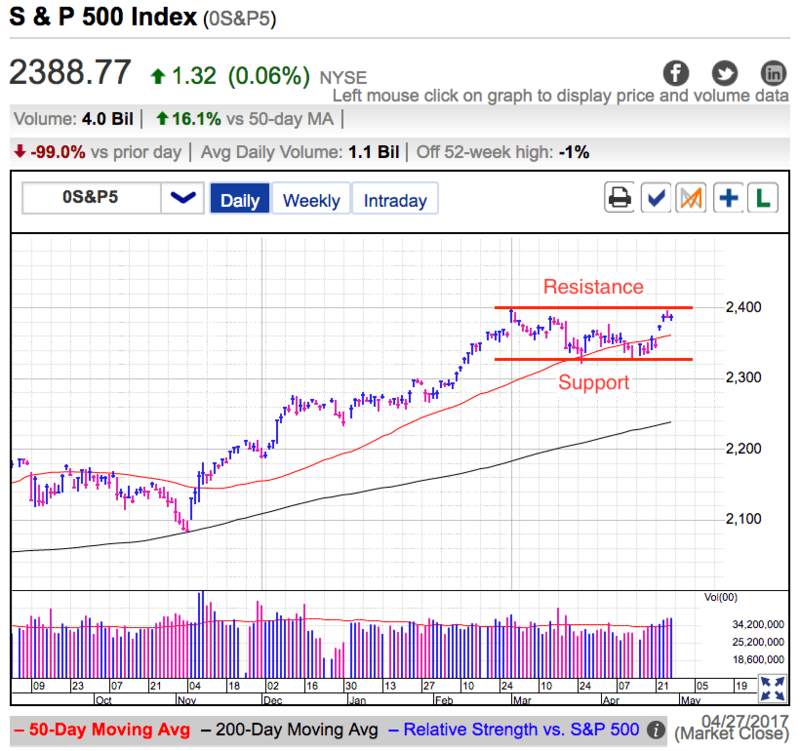 The S&P500 stalled at 2,400 resistance Thursday, ending an impressive streak of gains that kicked off the week. Investors cheered the positive result from the French elections, but after the initial euphoria faded, there wasn’t enough substance behind the headlines to justify buying above recent highs. As I wrote in Tuesday’s free blog post “the thing about “not-bad” news (the French elections) is it doesn’t do anything to improve corporate earnings in the U.S. We experienced a brief period of relief this week when we avoided a worst-case scenario, but now that we traversed those waters, we are largely left where we were a couple of weeks ago. We remain near the highs as hope for tax and regulatory reform remains high, but we are still waiting for Trump and the GOP to deliver on those promises. We couldn’t break through 2,400 in March and not much has changed since then.” And up to this point, the market is reacting exactly as I expected. Now that we are at the upper end of the trading range, we need something new to keep this going. The Trump administration unveiled “the biggest tax cut in U.S. history”, but the market didn’t react because there is zero chance he will get this by Democrats and fiscally conservative Republicans. While 15% tax rates make a great soundbite, he might as well be promising the moon because neither one is going to happen. Right now the market is trading in opposite world. Meaning it does the opposite of what conventional wisdom says it should do. Rather than selling a violation of support, we should buy it. Instead of buying the breakout, we sell it. When it feels like the market is about to collapse, buy. If everything is right in the world, sell. The reason traditional rules do not work is because the wider crowd of investors is not joining these directional moves. Overactive day-traders jump from one extreme to the other and cause these daily gyrations, but when the wider group of investors doesn’t join in, the move fails and reverses. As long as the larger group of bulls and bears remain stubbornly attached to their outlook, we shouldn’t expect these directional moves to take hold. Instead, keep buying weakness and selling strength. Currently we are at the upper end of the trading range, meaning this is a better place to be taking profits than adding new positions. 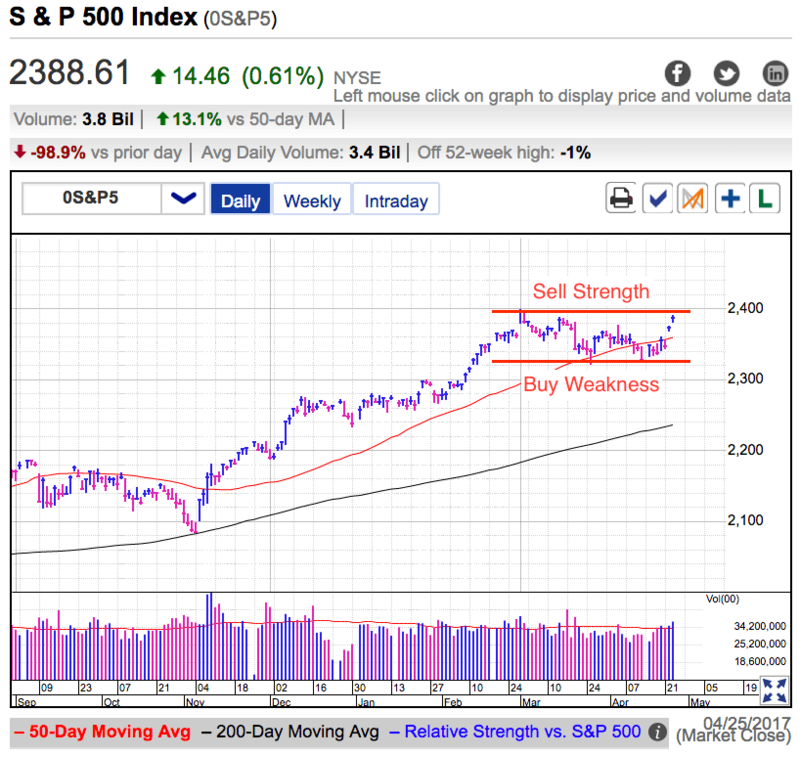 The longer we hold near these highs, the more likely it is we will break through 2,400 resistance, but without a substantive headline driving the breakout, expect the buying to fizzle and prices to tumble back into the heart of the trading range. At this point the only thing that will support sustainable breakout is the GOP getting their act together and coming up with a passable tax plan. Until then expect us to stay in this trading range and keep selling strength and buying weakness. Are Bulls Wrong this Week? The S&P500 added to recent gains Tuesday and is within a few points of all-time highs. This is a long way from the anxiety and uncertainty traders felt last week. In my April 18th free blog post, “Don’t Let the Bears Scare You”, I wrote that weakness was “a better place to be buying stocks than selling them”. Given this week’s strong performance, that was definitely the prudent trade. While it feels good to pat ourselves on the back, the most important trade is always the next trade. Now that we returned to the highs, everyone wants to know what comes next? The first thing we need to analyze is what brought out of last week’s doldrums. This rebound kicked into overdrive Monday when the French election went according to the market’s plan. While it was nice to eliminate this risk factor, “not-bad” news is a lot different than good news. The market would have been upset if two anti-EU candidate’s made the final round, but for what seems like the first time this year, a moderate is the clear front-runner. But the thing about “not-bad” news is it doesn’t do anything to improve corporate earnings in the U.S. We experienced a brief period of relief this week when we avoided a worst-case scenario, but now that we traversed those waters, we are largely left where we were a couple of weeks ago. We remain near the highs as hope for tax and regulatory reform remains high, but we are still waiting for Trump and the GOP to deliver on those promises. We couldn’t break through 2,400 in March and not much has changed since then. The next bogie on the horizon is Congress passing a federal budget. Even though the GOP controls the government, they have been unable to use their strength effectively. Last month they failed to repeal Obamacare and right now it looks like they are on the verge of screwing up even simple procedures. If the GOP cannot agree on the budget, then that endangers even more important things like tax reform. Most traders know market trade sideways more often than they rally or pullback. But we often forget that in the heat of battle. When prices are falling, we assume they will keep falling. When we rebound, we assume prices will keep rallying. But most of the time these periods of strength fizzle and bouts of weakness rebound. While most investors feel a lot better than they did last week, we should assume we will stay inside this trading range until something more meaningful happens. Just like how last week was a buying opportunity, this week we should be selling this strength. Expect us to remain rangebound until tax reform either passes or dies. Until then keep buying weakness and selling strength.